abortion | Utopia – you are standing in it! This entry was posted in constitutional political economy, law and economics, politics - USA, Public Choice and tagged abortion on November 9, 2018 by Jim Rose. 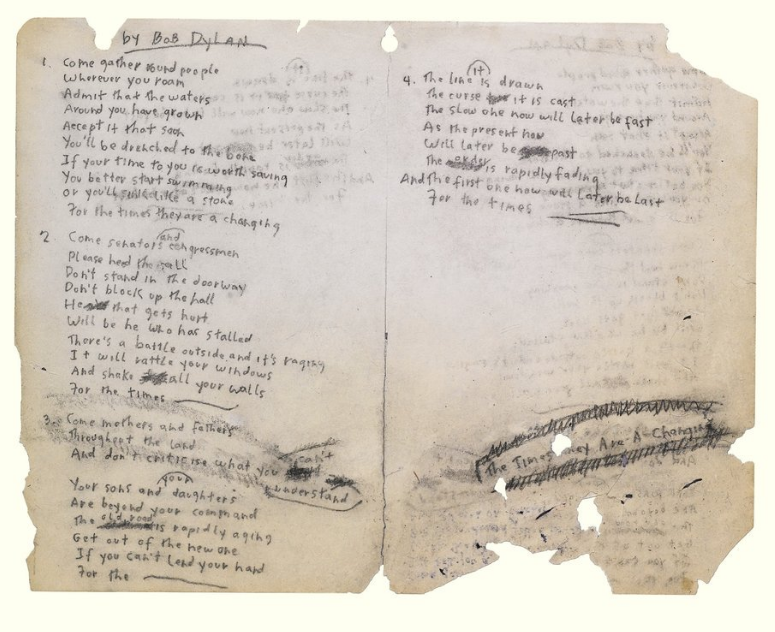 This entry was posted in discrimination, economics of crime, gender, health economics, law and economics and tagged abortion on September 13, 2018 by Jim Rose. This entry was posted in politics - USA and tagged abortion on July 6, 2018 by Jim Rose. This entry was posted in comparative institutional analysis, constitutional political economy, law and economics and tagged abortion, Justice Scalia on December 6, 2016 by Jim Rose. Is there a big gender gap on abortion in the USA? This entry was posted in economics of religion and tagged abortion, assisted dying, Catholics, end-of-life choice, euthanasia, gay marriage, meddlesome preferences, nanny state, Protestants, voter demographics on September 20, 2015 by Jim Rose. This entry was posted in economic history, gender, labour economics, labour supply, politics - USA, population economics, welfare reform and tagged abortion, economics of fertility, marriage and divorce, single mothers, single parents, teen pregnancy on August 16, 2015 by Jim Rose. On abortion, the USA is split on pro-life versus pro-choice. State legislatures pass laws safe in the knowledge that they will be struck down the next day. they were playing to a grandstand made up of values voters. When the supreme court became a little vague on some procedural aspects of abortion law in the early 1990s, the state legislatures started showing much more restraint because the median voter would be annoyed. Where Roe v. Wade to fall, some states would permit abortion, some would not. The Center for Reproductive Rights predicts that 21 states are likely to outlaw abortion immediately where Roe v. Wade to fall. This assessment is based not only on current law, but on the political makeup of the state legislatures. On the other hand, abortion is likely to remain legal in many states, according to these groups. 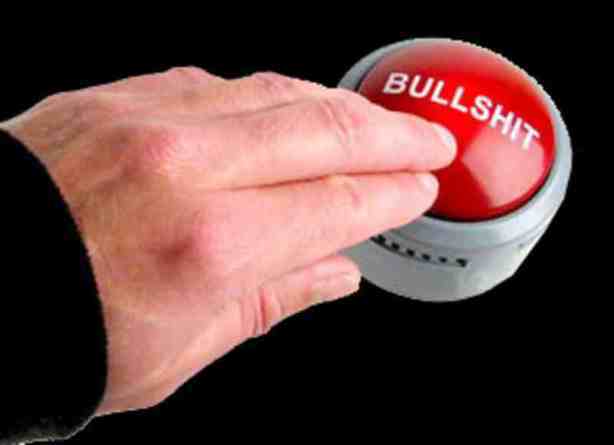 This entry was posted in constitutional political economy, economic history, economics of media and culture, health economics, politics - USA, Public Choice and tagged abortion, constitutional law, expressive voting, median voter, rational ignorance, rational irrationality, social change on July 26, 2015 by Jim Rose. Women have in recent years been more likely than men to hold the two absolute positions on abortion — saying it should be either legal under any circumstances or illegal in all circumstances — but these differences are not large. Within various age and partisan categories, men and women are mostly similar in their views. Only with respect to education, specifically those with a college education, is there a sizable gender gap. College-educated women are significantly more likely than college-educated men to believe abortion should be legal under any circumstances. via Education Trumps Gender in Predicting Support for Abortion. 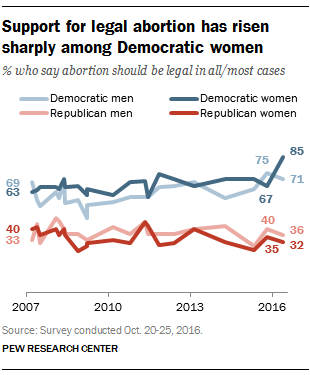 In the broadest terms, the largest segments of Republicans and Democrats have consistently preferred the middle "legal only under certain circumstances" abortion position. What’s changed since 1975 is that the percentage of Republicans favouring the "illegal in all circumstances" position has grown and the percentage favouring the "legal under any circumstances" position has decreased. The reverse pattern is seen among Democrats. 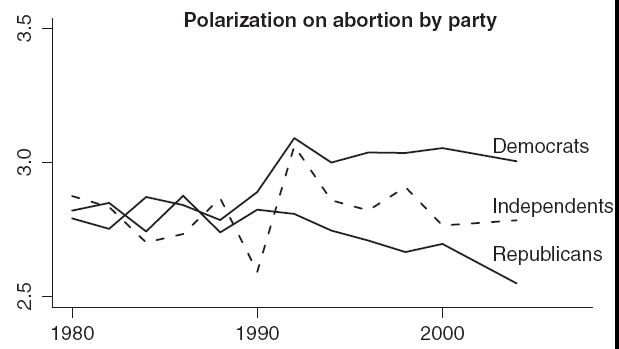 via Republicans’, Dems’ Abortion Views Grow More Polarized. The question I ask is why isn’t this substantial number of women with reservations to varying degrees about abortion not represented by the feminists who claim to speak on their behalf in the media? via Americans Misjudge U.S. Abortion Views. This entry was posted in law and economics, politics - USA and tagged abortion, activists, feminism on May 4, 2015 by Jim Rose. Not only is the abortion/party relationship primarily driven by whites, it is substantially stronger among white elites–that is, people with high income, education, or levels of political information. via How better educated whites are driving political polarization – The Washington Post. This entry was posted in economics of love and marriage, gender, politics - USA, Public Choice and tagged abortion, political polarisation on March 20, 2015 by Jim Rose.